A simple, thoughtful course for learning meditation and other mindfulness skills. Camp Calm is virtual retreat for learning the basics of mindfulness and meditation. 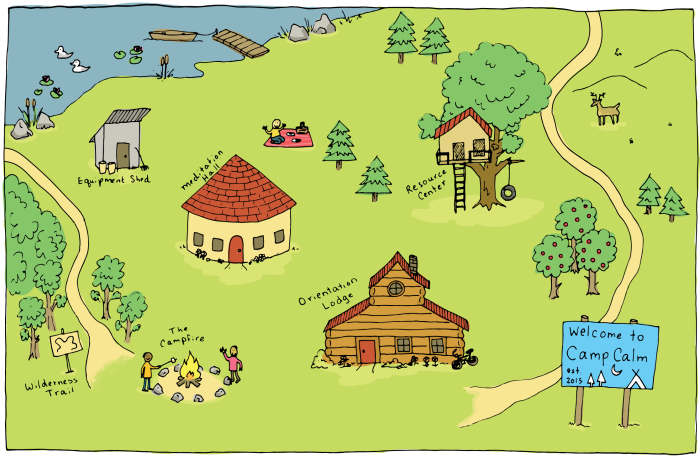 Camp Calm is an online course, and the different sections of the course represent different areas of the Camp. When you register, your first step will be to visit the Orientation Lodge. Here you’ll learn how Camp Calm works. After that you’ll visit the Meditation Hall, where you’ll learn the basics of mindfulness, and the meditation technique we’ll be using in the Camp. Then, whenever you’re ready, you’ll embark on the Wilderness Trail — the 30 daily lessons at the heart of Camp. Each day we look closer at one aspect of mindfulness practice, and do a short meditation. There's also a Resource Center, full of tips and techniques for addressing any difficulties that come up in your practice. Typically the daily lesson takes about 5 minutes to read, and the practices start at about 5 or 10 minutes. Throughout the Trail, I’ll encourage you to lengthen your sessions as your confidence grows, but ultimately it’s up to you. Each day’s practices are simple and don’t take long, but by the end of Camp, you will have achieved something significant: a modest but consistent daily mindfulness practice that you can build on for life. One of the most rewarding parts of Camp is discussing our practices with other Campers, which we all do at the discussion forum, nicknamed The Campfire. I answer all questions posted there, or you can email me if it’s private. Most people do the 30 lessons in 30 days, but you can do them at a slower pace if you like. If you’re particularly enthusiastic, and want to practice more intensively, there are options for that too. The Camp is designed to meet you where you are. You can do the Camp from any computer, tablet or smartphone. It is up to you what time of day you do the lessons. 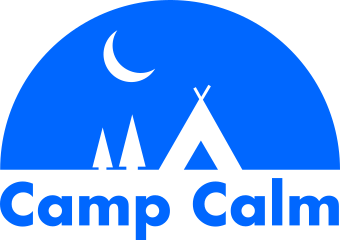 Camp Calm is operated by a single person (my name is David — hi!) and I keep the groups small enough that I can answer everybody’s questions promptly. I’ll do everything I can to help you establish a consistent mindfulness practice, even after Camp is over. More than 1800 people have taken the Camp since its inception in 2015. Want to learn to meditate in a supportive, low-pressure environment, with lovely nature themes and the nostalgia of Summer camp? Registration is currently OPEN. Come join us around the Campfire! 5. "But I Can't Stop Thinking!" Day 11: Am I Doing it Right? Day 20: How Much is Enough? Day 23: Where Was My Mind Just Now? Learn to live mindfully. No experience necessary. Camp Calm is a thoughtful, straightforward course for learning meditation and other mindfulness skills. Join other Campers in establishing a daily practice you can take as far as you like. Registration opens a few times a year. Enter your address and we'll keep you posted.